China launched its sixth Beidou navigation satellite Sunday, reaching another step in a program to provide precise positioning services across the Asia-Pacific region by 2012. 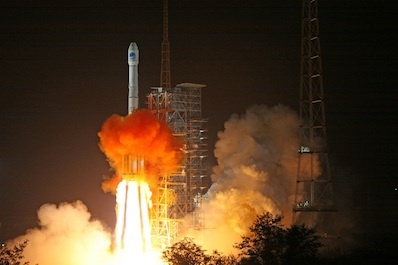 The satellite lifted off on a Long March 3C rocket at 1626 GMT (12:26 p.m. EDT) Sunday. It was just after midnight at the Xichang launch base in southwestern China's Sichuan province. The three-stage rocket, standing 180 feet tall at liftoff, placed the Beidou payload on course toward geosynchronous orbit, according to the Chinese government. According to tracking data, the spacecraft is in a preliminary orbit stretching from a low point of 115 miles to a high point of about 22,260 miles. Its inclination angle is 20.5 degrees. The Beidou, or Compass, satellite will fire its own engine to reach a circular orbit 22,300 miles above the equator. It is the sixth satellite launched in the first phase of the system's operational fleet. The craft launched Sunday is the fourth platform designed for geosynchronous orbit over the equator. One satellite is in a medium-altitude orbit more than 13,000 miles high, and another spacecraft was injected in an inclined orbit to cover Earth's polar regions. Four Beidou satellites have been sent into space so far this year. China plans one more Beidou launch in December, when another satellite will be sent to cover high latitude and polar users. The Beidou network will provide Chinese military and citizens an indigenous source of precise navigation information. The country currently relies on the U.S. Air Force's Global Positioning System. China will eventually launch 35 satellites to expand the system to global coverage by 2020. Most of the operational Beidou satellites will circle 13,000 miles above Earth. Five spacecraft will eventually support the system from geosynchronous orbit.